This past weekend I had the pleasure of attending the first annual My Taught You Retreat, created by CurlBox founder Myleik Teele. A 4 day, 3 night excursion at Nizuc Resort and Spa in Cancun, Mexico it was designed to restore, edify, and transform those in attendance. I have been a fan of Myleik Teele for several years; first as a purchaser of Curlbox, then a peruser of her Instagram feed and Snapchat videos, and finally a listener of her podcasts. I’m often asked why I “stan” (avidly support)Myleik and the answer is quite simple- she has helped me see the light at the end of the tunnel. Myleik does not shy away from the fact that she has worked hard for what she has. After years of keeping her head down and working, coupled with God given talents and grace, she finally began to see the fruit of her labor in her 30s. As a physician who spent all of my 20s and early 30s in school and training it was often tough and disheartening to see those around me “enjoying life” while I pursued what appeared to be a never attainable goal. Myleik’s success has been encouraging to see as it solidified to me the fact that when my day comes, it will be grand and more than I could have imagined. Approximately 1,500 women applied for the My Taught You Retreat with about 100 obtaining invitations. I received my invitation to the retreat on my birthday (talk about a gift!) Months leading to the event some of the attendees began to introduce themselves. As I read their biographies I was struck with admiration and anxiety. These women looked like me, styled their hair like me, even celebrated their skin tone like me. They were social media influencers, brand creators, and marketing facilitators who were the epitome of #blackgirlmagic . I was both excited and nervous to spend time with these women but knew it would be an experience like no other. On my arrival to Nizuc Resort I was immediately blown away by the sheer beauty of the premises. From sprawling gardens to white sand beaches the facility was a true escape into natural beauty. The spa treatment coupled with hydrotherapy unraveled the months of physical tension and stress I had been carrying in my body. The personnel were highly attentive and courteous, always going above and beyond to make the stay pleasurable. 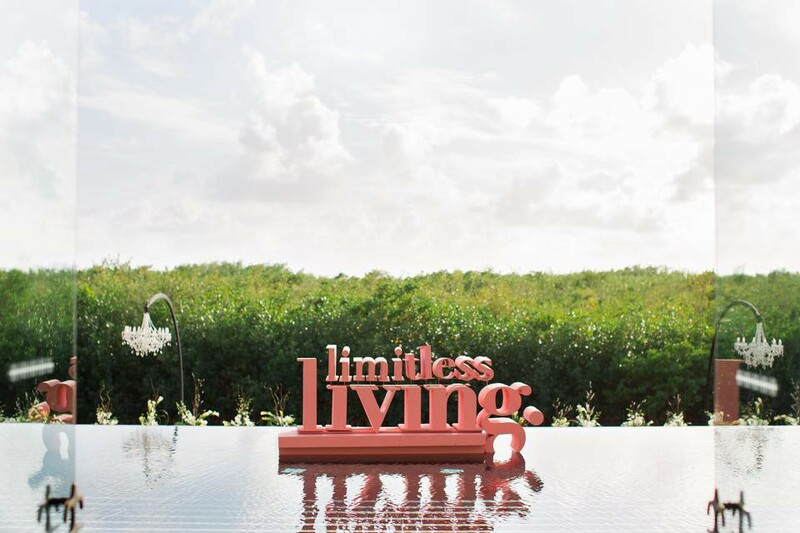 Themed “Limitless Living”, the retreat focused on examining boundaries in our lives created by ourselves and society. By recognizing and naming these limits we could then actively remove them, creating the shift in our lives necessary to reach our full potential. I am eternally grateful for the wealth of knowledge I received from speakers including Karleen Roy, Zim Ugochukwu, Kahlana Barfield-Brown, Jennifer Ekeleme and Luvvie. Myleik’s keynote speech on expelling limits caused me to take a hard look at myself and examine self-imposed barriers As someone who has always had God- confidence, it is now time to work on my self-confidence. Subconsciously I have allowed the question of “Who Am I?” to impact my work, relationships, and actions. I need to apply the same confidence I have in my Creator into me as well. It is time to bet on myself. If you can create the concept, you can create the product. Even if others are already doing what you want do to, no one can do it like you. Layers of mental, physical, and emotional abuse and trauma can stifle your creativity and inhibit your journey. Consider seeking therapy. Our learning did not only occur in the conference room. From poolside to bedside, conversations were engaging and thought provoking. The varying events like the fireside chat and slumber party created fun moments that will forever be etched in my mind. This was not Girls Trip (though several moments mirrored scenes from the movie). Rather this was an exercise in self-analyzing, allowing every woman to extract from herself what was preventing here from achieving here goals. It caused us to dig deeper, recognize the fluff, and unlock the chains. The tools we were given to level up will aid us in unabashedly creating the life we deserve. I spent the morning on my last day on the beach, watching the sun rise and reflecting on an amazing weekend. Prior to coming to Mexico I was thinking I didn’t belong in this space. That I didn’t deserve to be with these group of women, phenomenal in their own ways. An ambivert who often is more secluded than not, I kept wondering why God had given me this opportunity. Now I see why. He wanted me to remove the limits I had placed on my life. To open my eyes to the life He created for me when I was just a clot in my mother’s womb. Weaving me with other women, he wanted to show me the magic in community, in ethos. “Level Up” He kept saying, “Dig Deeper” He whispered, “Climb Higher” He advised. And that is what I will do. Thank you Myleik for believing in the Black Girl Collective and creating something iconic. Thank you for going against the grain and saying “Black women can do anything!” Thank you to the new community of women I have garnered who carry the same spirit of luxe living, self care, and full potential as I.
I can not fully describe what I feel inside after this trip, but do know it is somewhere on the spectrum between joy and awe. I am excited for the future and even more excited to bet on myself. What limits will you work on removing for 2018?